Odds and Ends, that you might not have considered. Miscellaneous Spa and Hot Tub Topics and Information. Solving some less common problems, with innovative products!!! New and innovative spa products can be used to solve common problems and even some less common ones, as well. The right product can provide a better and easier solution. A structural, concrete crack requires more than just epoxy. 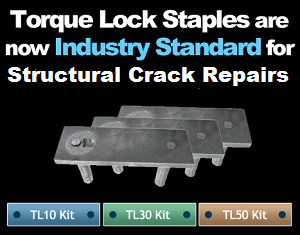 Torque-Lock Staples use 5000 pounds of torque, to hold the opposite sides together and make a rock solid repair. 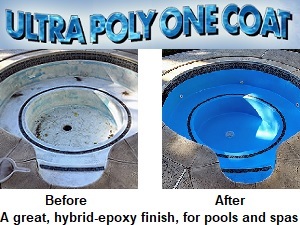 Ultra Poly One Coat is a hybrid-epoxy coating, that is easier to prep and apply and can be used to refinish masonry or fiberglass pools, spas and fountains. Keep the area around a pool or spa cleaner and they stay cleaner. A Water Sweeper Broom uses 1/3 the water and clean 3 times faster. Quality American-Made product, in 4 models. A ColorQ, all digital Water Tester can perform all of the common tests, while eliminating the color-matching and guesswork. With 10 models, performing up to 11 different test factors, one is right for every need. Get 21st Century water clarity, when you use a Nano-Stick Clarifier. Simply hang it in the water. Magnetic Water Conditioners help solve scaling problems, due to high levels of calcium hardness. How to solve some of the less common spa problems? Miscellaneous Spa Problems: that's where you might find information that has not been categorized more specifically. Some subjects just defy simple categories, so always look under related or overlapping topics. All of the archives pages have a list of related or overlapping topics, near the bottom of the page. You never know - you might actually learn something! If problems arise, refer to the Spa Problems Page, as a source of problem-solving information, broken down into various categories. Scroll down the page and click on the linked keywords, catch phrases or images, in the archived answers below, to access additional information, on that topic or product. I recently read an article talking about the benefits of soaking in an Epsom salts bath and wondered if my hot tub would be damaged if I added Epsom salts to the water. What do you think? Epsom salts are used, at high concentration, in floatation chambers. Much will depend on how much you add. In a spa it could cause corrosion, wherever two dissimilar metals are in immediate proximity. The same would be true, in a spa equipped with a salt chlorine generator. While I suspect that it can be done, I suggest that you contact the manufacturer of your spa, and ask if it could adversely affect the spa or equipment. I hope that I have been helpful. If so, please tell your friends and dealers about the website. I have read through your pages and am disappointed you are in US as I am in Brisbane Australia. I need help with the cracks in my spa. It is 9 years old and the place of original purchase has closed down. The colour of the fibreglass is marbled green and I think white in the cracks would look silly. I would prefer a tradesman to come out to repair but I can't find anyone that actually does this sort of work. Surely we aren't the only ones with this problem. I might give you the same advice, even if you were in the US. Repairing a crack with epoxy will leave a white line. You could paint the spa. afterwards, with a product like Ultra Poly One Coat and create a uniform look. The problem is that epoxy may not prevent the crack from expanding. So reinforcing, the underside, might be necessary. While it might prove difficult to find someone that repairs spa cracks, the same should not be true of people that make repairs to fiberglass boats. So look for a marine repair specialist, that is willing to work on a spa. I hope that this leads to a solution. ► Hair And Fingernails Are Turning Green? Our spa is turning our hair and nails green! I chlorinate and use water clarifier regularly. What is happening? Not a good thing! Your hair and nails are turning green, as a direct result of copper being present, at unacceptably high concentrations. You can confirm this by having an copper analysis performed. However, this is a virtual certainty! Unless you are using poor quality well wa ter, it is coming from the copper heater core. The reason that this happening is because of low pH conditions. You stated that you are using chlorine: the only type you should be using is dichlor granular added directly to the water. 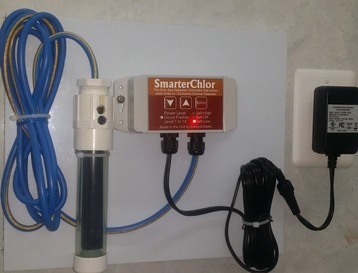 Never add chlorine through the skimmer or use trichlor tablets! I suggest that you drain the spa and start with a clean page. You need to pay attention to the pH and total alkalinity, as this type of corrosion cannot occur, with chlorine use, unless the pH is low. You will destroy the heater, if this continues. You might consider having an ozone generator installed, as it will make for better water quality and reduce the amount of chlorine required. Add a salt chlorine generator should help you avoid low pH conditions, while providing an easier and better way to use chlorine. Unless you make sure the pH remains in the 7.2-7.8 range and not below 7.0, your heater will be destroyed. Try using an acidic shampoo and conditioner on your hair to help remove the color. You might read through the archives on spa water chemistry, spa water testing and other related topics. Good luck and I hope that I have been helpful. I have never seen figures for water loss for a spa that remains properly covered, except for periods of actual usage. Depending upon the size and shape of the spa, an inch of water loss could amount to 10-20 gallons. I suggest that you start looking for evidence of a leak. If you conclude that there is a leak, it should be possible to seal the leak. Fix A Leak is a leak sealer that can repair and seal small spa leaks. Looking for wet insulation might help you locate the source of the leak. Calling in a leak detection specialist would be a sure-fire way to locate the leak and make the necessary repairs, but it is not inexpensive. Try the Fix A Leak and see what happens. Good luck. ► Spa Cover Deterioration Or Mold? The images appear to be too uniform, for me to conclude that it is a mold issue. That being said, deterioration of the plastic is not something that I can rule out. You can try cleaning it with a Tilex spray and then hosing the cover off. Using a Nano-Technology Spray Cover Protectant might help the cover last longer and extending the cover life would be a worthwhile goal. An application of Nano-Spray can protect for 6-12 weeks. Sorry that I couldn't offer more help. We live in a hard water area. I've had problems with my spa due to scale forming. Besides the scale deposits, I've had white flakes shooting out of the returns. Any suggestions? You could fill you spa with soft water, that is if you have one. Some manufacturers recommend against using soften water, but if you adjust all of the spa water chemistry parameters - especially the calcium hardness, pH and total alkalinity - to within normal suggested ranges, there should be no problems. You could add a calcium sequestering agent and try to keep the pH closer to 7.2 and the TA, if possible, within 80-120 PPM. 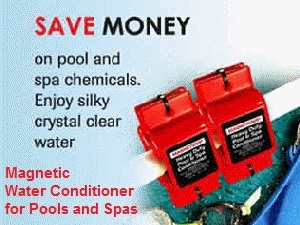 A spa water magnetizer or magnetic water conditioner is another possibility. This strap-on device has been reported to help reduce spa calcium scaling problems, as well as improve some other spa water parameters. There are models to treat pools or an entire house. I hope that I have given you some options. Good luck. I would like to fill a 400 gallon spa with well water. The spa will be sanitized with an ozonator and a bromine floater. I plan on adding some metal treatment before the chemicals. Anything that I should do? Have the water tested, to know what you're dealing with. You could use a metals removing pre-filter, such as a METALTRAP Filter, which will help remove the metals that lead to staining and discoloration. It is far better than just adding chemicals. After the spa is filled, you should continue with the METALTRAP Filter, when adding new water, to help maintain better water quality and reduce chemical consumption. If the water contains less than 1 PPM of heavy metals, you can use it to refill the spa, as many as twenty times. If the water is of really poor quality, you should use the METALTRAP Dual-Cartridge Filter, which removes metals, plus contamination and sulfur. I hope that this information proves helpful. ► Hot Tub Water Loss? I don't recall ever seeing figures for water loss for a spa that remains properly covered, except for periods of actual usage. From my own experience, it seems to be well beyond what should result from evaporation. Depending upon the size and shape of the spa, an inch of water loss could amount to 10-20 gallons. I suggest that you double check that the cover is sealing reasonably well and then start looking for evidence of a leak. In the final analysis, if you conclude that there is a probability of a leak, it should be possible to seal the leak. FIX A LEAK is a leak sealer that can be used to create a permanent repair, when added to the spa water and/or equipment. However if the leak is a cracked pipe or loose connection, it may not seal. If that is the case, you might benefit from a leak detection service. It should be used according to the product instructions. Good luck. I am pregnant and still would like to use our spa. I know our chemicals actually say to have the temperature set at a minimum of 98 degrees. Is it possible to have it cooler and use pool chemicals instead. The temp. I had in mind is the mid to high 80's. Thanks. Did you check with your doctor? There is no problem using the spa at a lower temperature, provided that adequate amounts of sanitizers are maintained. It is a common practice, especially during hot times of the year. Depending upon the sanitizer being used, you may not have to change anything. I would not suggest using pool chemicals, as you are dealing with a very small amount of water. Pool chlorine tablets, for example, would still dissolve far too rapidly. To be safe, stick with spa chemicals and test the water, before and after each use. Good luck with the baby. We bought a house with a custom inground spa. After refinishing the interior and upgrading the pump and filter, I find that the suction, from the bottom drain, is too strong. How should this be fixed, so as not to risk an accident? Thank you for your help. You need to install an anti-entrapment safety drain cover. There are VGB compliant safety drain covers, that will help avoid the grave consequences of hair or body entrapment. Check to make sure that all safety features meet the requirements of your current local regulations. I hope that this information will be help solve the problem and provide some piece of mind. ► Spa Cover Is Too Heavy? I use my spa for my arthritic condition. I find the cover quite heavy to remove and handle. Are there lighter weight covers? The one I have is about 3 inches thick with a plastic cover. Thank you. It is possible that the cover has become water logged. I had a similar problem and had to replace the cover. There are spa cover removers and lifters, that can easily remove the cover without effort. There are lighter weight covers, as well. I suggest that you discuss the matter with a local spa professional. Good luck. ► Asking The Right Questions? We are going to be looking for a spa within the next few months. We will probably want something that can accommodate 4 people. We realize that there are lots of features to choose from and ways to sanitize. But, what should be ask of the dealer? Some questions are always best asked before you sign on the dotted line. Here are some things to ask. All may not apply to every situation. Ask how long the dealer has been in business! Has he done business under other names? Is he licensed, bonded and insured? Will he provide complete start up instructions? Make sure the warranties are spelled out completely! Does he provide service after installation? Will he be responsible for any damage to property during installation? If a permit is required, who applies and obtains it? Good luck with the spa and enjoy the hot water experience. Looking for an "in-ground" spa near Atlanta and don't know where to start. I live near Atlanta, Georgia, and I want to buy a spa - not a hot tub - which is designed to be permanently installed in the ground but all I have found on the web so far are "portable spas" which include all the costs associated with making the damn things "portable." I would rather spend my money on a bigger spa that is NOT portable and have it professionally installed in our back yard (in a hole in our deck where the air conditioners used to be). We even have a water supply right next to the spot where we want the spa. Where should I look for such a thing in the Atlanta area? Who are the "reputable" dealers? How does one avoid the "problem" dealers? How much should I expect to pay for a big in-ground spa that has TWO LOUNGES? Thanks for your time. What you want is doable. And I can understand your justification. So far as a dealer and pricing, I can offer little direct assistance. You could start with a local spa dealer and see if the product can be ordered without the external cabinetry. There is one more important thing that you must check into. In most areas, what you are contemplating is akin to an inground pool and might require all of the permits associated with inground pools. In addition, it could impact your property taxes. Portable spas do not usually have these problems. How would you access the equipment or the plumbing? Where would the heater and filter pump go? You need to do some homework. That's one of the reasons the portable spa is so popular. Good luck with your decision. If you ever have a spa water problem, please come back and visit the website. We are looking to buy a 350 gallon Spa. We have a small child and I have several allergies, including nickel allergy sensitivity to chlorine and eczema. So, what would be the best and most cost-efficient sanitation system to purchase with the Spa? Thanks. Cost efficiency shouldn't be your prime interest. Effectiveness should! An ozonator and a mineral sanitizer, to act as a backup sanitizer, would be both effective and cost efficient. Spas are available with built-in ozonators and mineral sanitizers are simply add-ons. This combination contains no nickel compounds, chlorine or bromine, should be easy on the skin and keeps chemical treatment at a minimum. I hope that this information proves to be helpful. ► Planning For An Indoor Spa? We plan on using an addition to our house for a spa. What should we do to the room to prepare for the spa? How big a spa would you suggest for a family of four? What's the best and easiest way to sanitize the water? Thanks for the help. The spa will create a lot of moisture. It would be best to keep the spa room isolated from the rest of the house. Make sure that the proper materials are used in the construction. Choose a contractor that is familiar with the special requirements of a spa enclosure. An exhaust fan would be a good idea. A spa of 250-300 gallons will usually be set up for 4-5 bathers. The choice of jets is an individual matter and be tailored to suit your preferences. Make sure that the height of the spa will go through the entrance to the room. It is easier than ever to sanitize a spa. Spas can be equipped with ozonators, UV sanitizers, salt chlorine generators, ionizers or mineral sanitizers for convenient and effective sanitizing. Plan on keeping the spa covered, while not in use. This will help keep the moisture level down and will save on electrical usage. Thermal cover removers are available. I hope that this information will prove helpful. Please come back and visit the website, if you ever need help with spa water chemistry, spa water quality or maintenance issues. Enjoy the spa. ► Spa Cover Is Too Heavy to Handle? I find the spa cover a bit too heavy to handle. I am not as young as I used to be and my wife certainly can't remove the cover by herself. I bought the spa because of arthritis and I would like to minimize the effort. I think that I recall seeing some type of cover appliance in a magazine picture. Appreciate the help. Regards. You remember correctly. There are spa cover removers that tilt the cover out of the way with the a minimum of effort. You can even add a scenic backdrop, so you don't have to look at an ugly uplifted spa cover. Your local spa professional should be able to decide on a product suited for your needs. Enjoy the spa. ► Considerations Before Spa Purchase? I want to buy a home spa, but am now confused about a couple of things. Under the topic of salt water spas in 2006 you said: "Saltwater chlorinators are available for use in spas and offer similar advantages: complete elimination of chlorine chemical products, easy maintenance and improved water quality - just to name a few". Does your positive opinion of salt water chlorinators still stand today in 2008? I have not purchased my spa yet, and am really trying to investigate this beforehand, as I want to make the right decision. Recently a spa salesperson advised against the salt water chlorinator, saying it wasn't less maintenance or chemicals. Was he mistaken? 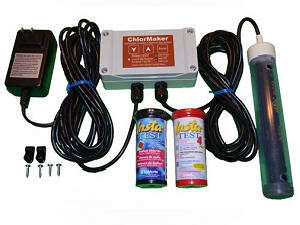 Is a salt water chlorinator the same as a salt chlorine generator? Is there a brand of salt water chlorinators for spas that you recommend? If you get one for your spa, would it make sense to add an ozonator or uv sanitizers or a micron high efficiency filter? Or do they become redundant or overkill if you have the salt water chlorinator? I am looking for a spa with minimal maintenance, low chemical usage, and one that we can leave for a month when we go on holidays. I don't want to add chemicals and check levels all the time, especially before and after each use. Does such a spa exist? The second issue is that one manufacturer does not use any foam insulation and argues that his hot tub is designed for energy efficiency in a cold climate, while another manufacturer says that you have to have spray foam insulation in order to achieve this. Can you speak to that? Thanks so much for your time, your website is great! Yes, I still like salt chlorine generators and so do millions of other pool and spa owners. A salt chlorine generator does not mean "no work or no chemical," but it does make for easier maintenance and no chlorine handling or storage. A completely, chlorine-free system is hard to come by. The correct terminology is salt chlorine generator, saltwater chlorine generator or salt chlorinator. Salt water generator is incorrect, but it is referring the same piece of equipment. It is far more popular is the swimming pool application. Adding an ozonator or uv sanitizer has advantages: it will allow you to maintain a lower chlorine level. An ozonator is not a stand alone sanitizing system. It needs back up. However, it provides oxidation without the addition of chemicals that lead to chemistry changes or buildup. UV sanitizers add no chemicals, but helps assure that the return flow is almost devoid of microorganisms, allowing for lower chlorine levels. A spa without insulation would not be overly energy efficient, as it would be subject to unwanted and unnecessary heat loss. Electricity is expensive enough, without wasting it due to poor insulation. I would look for an energy efficient brand. Having an ozonator or UV sanitizer will help provide the sanitation, during periods of absence, as they can be operated, with the timer controlling the pump and filter. Good luck and enjoy the hot water experience. ► A Spa Or A Hot Tub? My wife and I are considering buying a spa. We can't even agree on the name. She says that a hot tub is not a spa and I say that the terms are used loosely. What are the advantages or disadvantages? And who's right? Thanx. Who's right? Both! The terms hot tub and spa are used interchangeably, but they are different. Hot tubs are constructed like a barrel split in two. There can be vinyl liner inside to prevent leaks and keep the water away from the wood. Jets, blowers, heaters, filters can be present, in both types of units. Spas are usually made from a resin material surrounded by a cabinet. They come in all types of sizes and shapes. Interiors are shaped with seating and loungers. Jets and blowers can be used to great effect. The hot tub tends to be higher than the spa and that can make entering the water require a step or steps. Spas have a much more modern appearance - hot tubs a more rustic look. Hot tubs are built for soaking. Spas are made for sitting or lounging, while experiencing the relaxing agitation and aeration of the water. Call it whatever you want. The choice is yours to make! Pick out a spa or hot tub that will make you both happy, because you'll be in hot water together! Good luck with your choice. ► Remote Freeze Alarm Monitoring? Is there such a thing as a freeze alarm for hot tubs that can be connected to a home alarm system to notify the owner of loss of the hot tub heater system at a weekend only location. The house is monitored for low temperature (i.e. : furnace malfunction etc.) intrusion and fire. Thank you. Waiting until freezing actually occurs would be too late. If the heater is left on during the periods of absence, a sensor could be added to send a signal if the temperature falls to 80°F. This would alert you that something is wrong and still allow plenty of time to avoid freeze-thaw damage. While I don't have specific details on the equipment required, I have no doubt that it could be easily accomplished with a home automation product. Good luck and I hope that I have been helpful. I have a spa on my screened in patio. The patio is surrounded with planted beds. Can I hurt the plants by allowing the water to drain into these beds? Thank you. Spa Chemicals are not herbicidal and should not cause damage to the plants. If you have no other choice and the area is well drained, I don't see a problem. I hope that I have been helpful. ► Not In Control Of The Spa? When I set my spa to come on at certain times, it will work for maybe 2 or 3 days. Then it will turn off it will not trip the breaker. I tested all the fuses. I can reset the time, but it goes for another 2 or 3 days. Then off again. Sometimes it goes off when it turns on after 20 or 30 minutes. Any answers? Thanks. Obviously, it is possible that you can have a controller problem and I can offer little assistance. It is also possible that your controller is set incorrectly. For example. Some controllers can be set so that operation is based solely under the control of the timer. Other units can be controlled based on temperature control. Check to see if your controller has a selector for choosing either timer control or temperature control. It may be set to temperature control and that could explain the situation. Other than this, there's not much that I can add. Over the years, there's been a lot of different equipment in use and not everything applies to all. Check to see if the spa manufacturer has an online trouble-shooting guide. Good luck. We found recently many orange spots on our 5 spa filters that are not disposable. We have used a degreaser/cleaner but there still there. Scrubbing doesn't work either. Could these orange spots contribute to our constantly cloudy water? What are the orange spots and how do we get rid of them? Could they also be in our pipes? Please help. Thanks. This is not something that I can recall ever having come up before. The most likely cause of the orange spots is rust. There could have been iron flecks in the water used to fill the spa. Trying using a vitamin C tablet on a spot. Rub it in a form a wet paste. Give it 30 minutes, If this works, it is definitely a metal problem: most likely iron. Test the spa and source water for iron. If present, consider draining the spa and refilling using water that passes through a MetalTrap Filter. You could soak the filter in a solution that contains some MetalTrap Stain Remover. I would add some metal treatment to the spa to prevent more stains. DO NOT ADD METAL TREATMENT, IF YOU ARE USING A MINERAL SANITIZER, AS IT MAY INTERFERE WITH ITS ACTION. If this doesn't work, it may be a bacterial problem. Try soaking the cartridges in a solution to which 8 ounces of liquid chlorine has been added. Give it an hour or two. If this works, this is proof that the problem is a microorganism and is related to inadequate sanitation. This would also explain the cloudy water problems, as well. You need to review the sanitizing practices. This sounds like a commercial unit and you should have an ozonator and or a UV sanitizer in operation, in addition to some other backup sanitizer. I hope that this information will prove helpful. We are planning to finish off part of an extension, in order to enclose our spa. The room will have an exhaust system and is separated, by sliding patio doors, from the rest of the house. Do we have to keep the cover on the spa? The exhaust is a good thing. However, unless you are going to run the exhaust all of the time, eventually the humidity will lead to problems. Having the spa covered when not in use will not only save on electricity, it might save the room from the effects of humidity. My advice would be to find a contractor that understands what a spa enclosure will require. If left uncovered, the dissolved salts and mineral will continue to rise in level, as evaporation leaves the salt and minerals behind. Good luck.